Raymarine Dragonfly 5 Pro Gold. 5" CHIRP Sonar/GPS Combo with DownVision plus conventional sonar. Wi-Fi built in. Includes Navionics North American Gold lakes, rivers and coastal map. Dragonfly Pro combines GPS navigation with Raymarine's advanced dual-channel CHIRP sonar. 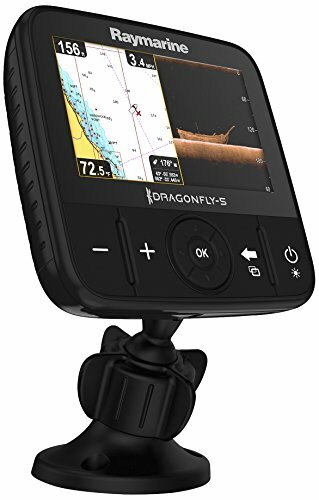 Dragonfly Pro will change your underwater view and maximize your time fishing with Raymarine's wide-spectrum CHIRP technology. Easily identify fish and underwater objects with photo-like sonar images from the DownVision channel and target fish with the conventional CHIRP sonar channel. A built-in 50-channel GPS delivers precision guidance and built-in Wi-Fi lets you stream live sonar right to your smartphone.